"Bomb style on a budget, her AND the kid", a MODGBLOG post. Yea, she'd drink with me... here is what I mean. 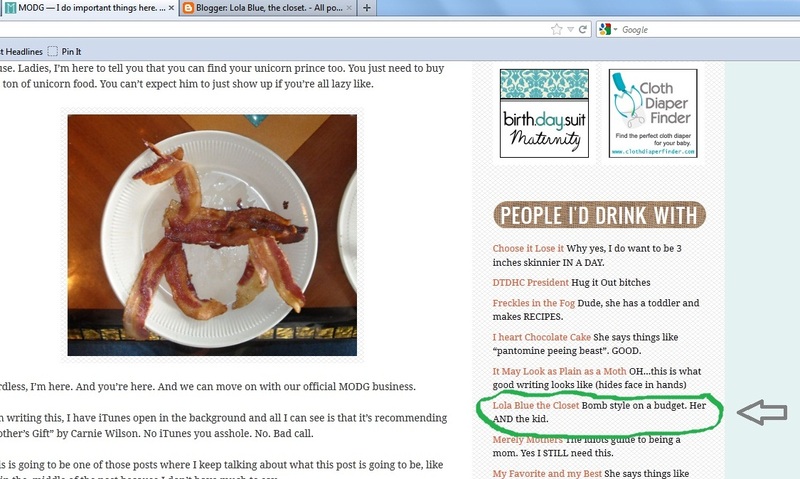 One of my guilty pleasures is spending time reading my favorite blog: modgblog. I've been reading it for about 2 years now and every single time I read a new post I literally L O L. She is hilarious and talks about the most "realest" things on being a mom (when I started reading she had just found out she was preggo) being a woman, shoes, vaginas, the big H word, her cats and of course being married to B. Over the course of time, she's become a celebrity in the blog world, even has a book deal in the works now. This is a must read for any woman, mom or not, married or not, I guarantee you will L O L just like me at her posts. She is just one of us... but funny-er. And now I am on her blog page :) Check it out! PS: MODG mean Martinis or Diaper Genies. And you say it all together, don't spell it out. Ha. Is that a paid gig?